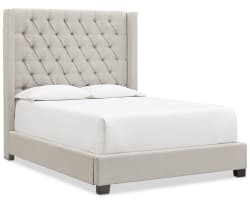 Macy's offers the Monroe Upholstered Queen Bed in Light Grey or Charcoal for $299 plus $99 for shipping. That's $200 off and the lowest price we could find, although we saw this for $20 less on Black Friday. It measures about 62" x 85" x 68".